[ Africa] - ROSACCIO, G.
Map maker : ROSACCIO, G.. Date : Bologna, Antonio Pisarri, 1594 - 1688. Size : 5.1 x 6.8 inches. / 13.0 x 17.3 cm. 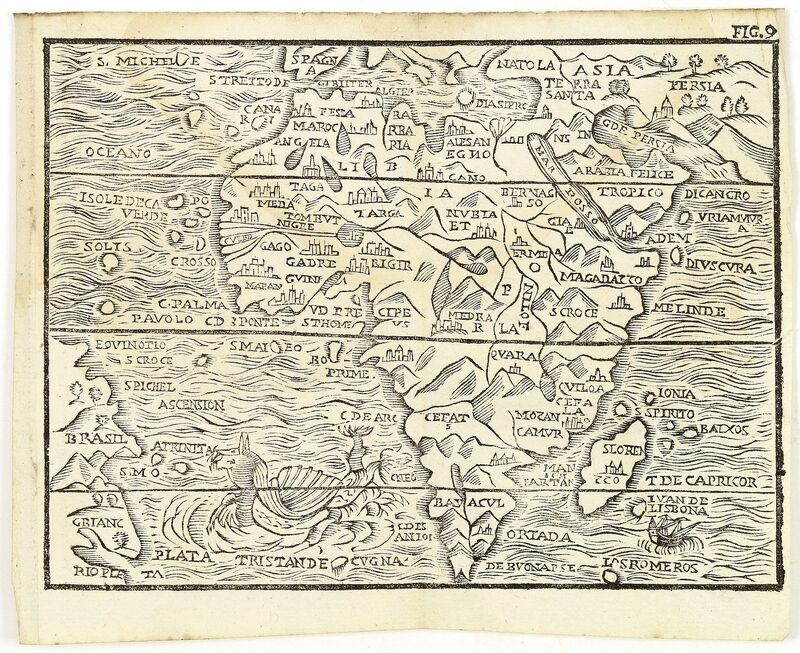 Description :Charming wood block map of Africa by the Italian XVIth and XVIIth century writer, humanist and cartographer Giuseppe Rosaccio. Taken from the 1688 Bologna "Teatro del mondo e sue parti cioe Europa, Africa, Asia, et America". For this edition new larger wood blocks were cut by Giuseppe Moretti. The maps are now printed from one wood block and not two as for the previous editions. This is therefore the rarest and most desirable editions. The interior is filled with mountains, trees and with a few places represented by large castles. There is a large sea monster in the Atlantic Ocean and one small ship in the Indian Ocean. Condition : In fine condition. Dark impression. A light water stain in upper part of the map. Right hand margin cut close.